Q: I’d like to do a dynamic stamp with an incremental number. So for example, I click on a stamp that says “Exhibit”, and each time it’s applied to the page the number would increase i.e. “Exhibit 1″, “Exhibit 2″, “Exhibit 3″, etc…. Is it possible in PDF Studio? 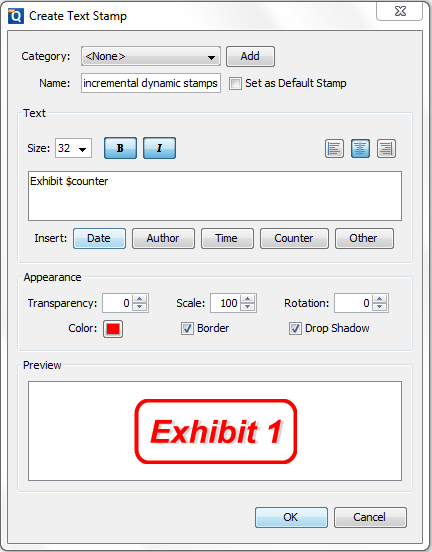 – When you place the first stamp, it will display a dialog prompting to enter the starting number for the stamp counter. If you right click on Rubber Stamp icon and check “Sticky” option, the number will increase by 1 for each placement. Below is an example showing that placing a pre-defined dynamic text stamp with “Sticky” option checked.